Free Lecture, but you must sign up early to save your seat as space is limited. Sign up by Dec. 8. Call 209-728-6171 or email manzanitawp@gmail.com. This will be a fantastic visual and oral journey into the depths of the earth where participants will visit the largest cave on earth and experience it through Dave’s presentation. Light refreshments, a glass of wine or other beverage, and good company. Donations gladly accepted to continue the Manzanita Second Sunday Speaker Series. 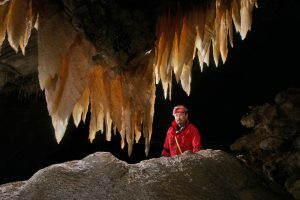 Dave Bunnell shares information and fascinating details about caves of the world in a free lecture. 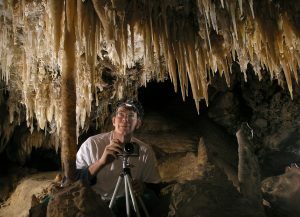 Dave is a renowned photographer and cave expert in our region, with several books about the subject, including the new book on Natural Bridges. He holds a PHD in Psychophysiology and spent about 10 years doing research in human sleep patterns. In 1996 he left the academic world and assumed editorship of the monthly National Speleological Society or News, which he continues today. This is the only national magazine in the USA devoted to cave exploring. He has been caving since 1973, starting in the eastern USA but has caved mostly in western USA caves and on expeditions to a couple dozen countries. Recently he went to Hang Son Doong, largest cave passage in the worId, and came back with hundreds of images. His photo work has appeared in numerous books and magazines, museums, calendars, Web sites, ads, showcave brochures, and postcards. He creates photos for the four show caves in California’s Gold Rush country. He now produces cave postcards under his photo company’s banner, Under Earth Images. He has produced seven cave-related books, two on sea caves, two on specific caves, one a guide to cave formations, and one on lava tubes. The latter was called Caves of Fire, Inside America’s Lava Tubes and had its second, majorly revised edition printed in 2013. He has a few other cave book projects planned or in progress. One of his recently released books is titled, Natural Bridges. Dave has a highly ranked Web site called the Virtual Cave which educates about caves and cave formations of all types, at www.goodearthgraphics.com/virtcave. 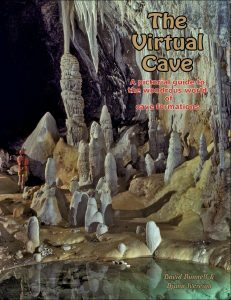 One of his recent books is based on this web site, called The Virtual Cave: A Pictorial Guide to the Wondrous World of Cave Formations. He currently resides in Angels Camp along with his wife Elizabeth, who often assists him with cave photography and now with book production.